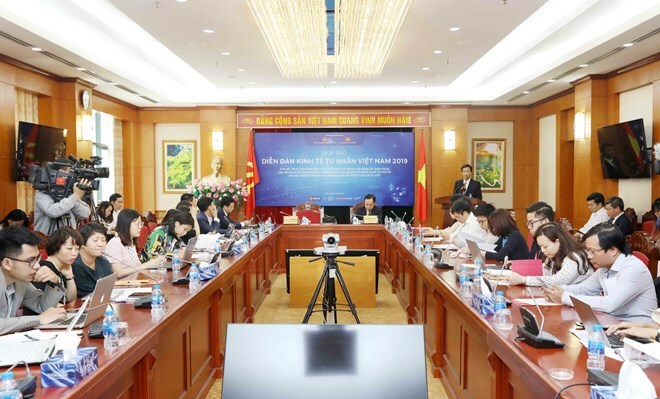 Hanoi (VNA) – The Vietnam Private Economic Forum is scheduled for May 2 and 3 in Hanoi, announced the Party Central Committee's Economic Commission on April 5. The forum aims to review the implementation of a resolution on making the private sector an important part of the socialist-oriented market economy in Vietnam over the past two years. The forum will include a plenary session, chaired by leaders of the Government, the Party Central Committee's Economic Commission and National Assembly. Some 2,500 private firms will have a chance to voice their opinions and proposals to Party and Government officials. Six seminars are set to take place, revolving around attracting wealthy tourists to stay for a long time in Vietnam; establishing argo-foretry-fishery chains of high commercial value; and developing the digital economy and new business models; among others. The commission has also planned a conference for female entrepreneurs and an exhibition on development achievements of outstanding private firms and investment connectivity activities.